The elbow joint is composed of the distal end of the humerus and the proximal ends of the radius and the ulna (see the images below). The humerus contributes the humeral condyle, composed of the trochlea medially from anterior to posterior and the capitulum laterally on the anterior aspect, to the articular surface of the elbow joint. The humeral condyle itself is a rounded, almost tubelike structure that occupies most of the space of the distal end of the humerus and is located centrally. The condyle is covered in articular cartilage and allows the hooking-on of the C-shaped trochlear notch of the ulna and the concave superior aspect of the head of the radius. The humerus has small indentations just superior to the condyle on the anterior aspect; the radial fossa (laterally) and the coronoid fossa (medially) allow the humerus to accept the head of the radius and the coronoid process of the ulna when in full flexion. On the central aspect of the posterior humerus above the trochlea of the humeral condyle is the olecranon fossa, which allows the humerus to accept the olecranon of the ulna when in extension. The olecranon is the proximal end of the ulna, from which the C-shaped trochlea notch is carved. Lateral to the humeral condyle are the medial and lateral epicondyles, and superior to those on their respective sides are the medial and lateral supracondylar ridges. The epicondyles and supracondylar ridges act as attachment sites of for ligamentous supporting structures of the elbow, as well as for muscles that cross and act on the elbow joint. The ulna contributes the articular cartilage–covered trochlear notch to the hinge of the elbow joint, which is carved out of the olecranon process at the proximal end of the ulna. The olecranon posteriorly acts as an insertion point for muscles crossing the elbow joint. Anteriorly, the anteroinferior portion of the C shape created by the trochlear notch culminates in a blunt central point called the coronoid process. Inferior to the coronoid process on the anterior aspect of the ulna is the tuberosity of the ulna, after which, further distally, is the shaft. Laterally on the proximal end, next to the coronoid process, is the radial notch, in which lies the head of the radius. Below the radial notch lies the supinator crest, just anterior to which is the supinator fossa. The supinator fossa is a longitudinal space along the proximal one quarter of the shaft of the ulna; its anterior border is the interosseous border. The radius contributes the superior aspect of the head of the radius proximally to the hinge portion of the elbow joint and contributes the medial circumferential aspect of the head of the radius to the radioulnar articulation. Distal to the head of the radius is a narrowing of the bone, referred to as the neck, and anteromedially is the radial tuberosity, followed distally by the shaft of the bone. On the medial aspect of the radius lies the interosseous border of the radius. The elbow joint has a synovial membrane–lined joint capsule that is contiguous between the hinge and radioulnar aspects of the joint. The synovial lining covers the internal surface of the fibrous joint capsule and the nonarticular surfaces of the joint that are located intracapsularly. The superior aspect of the joint capsule begins just superior to the coronoid and olecranon fossae and continues inferiorly, covering just past the proximal radial-ulnar articulation. Medially, the joint capsule thickens to form the medial or ulnar collateral ligament, which extends from the medial epicondyle of the humerus to the coronoid and olecranon of the ulna. 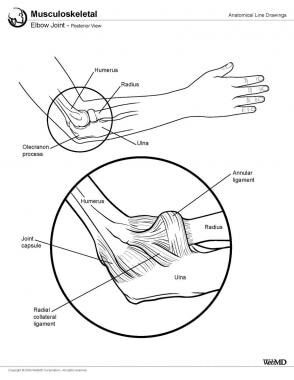 The ulnar collateral ligament is a triangular thickening with 3 main bands: the anterior or cordlike band, the posterior fanlike band, and the oblique band. The oblique band also helps to deepen the trochlear notch. Laterally, the lateral or radial collateral ligament extends from the lateral humeral epicondyle and distally blends into the anular ligament of the radius. The anular ligament of the radius wraps around the head of the radius and attaches to the ulna anteriorly and posteriorly. The surface of the anular ligament is lined with synovial membrane and allows the head of the radius to rotate inward during supination and pronation, while maintaining stability of the radial ulnar joint. Three major bursae are located at the elbow joint. First is the subcutaneous olecranon bursa, found in the connective tissue over the olecranon; second is the intratendinous olecranon bursa found in the triceps brachii tendon; and third is the subtendinous olecranon bursa, which reduces friction between the triceps tendon and the olecranon proximal to its insertion on the olecranon. The humeroulnar articulation engages primarily in flexion and extension in the sagittal plane, with flexion to 150º and extension to 0º in the neutral position. The biceps brachii, brachialis, brachioradialis, and pronator teres all flex the elbow. The triceps brachii and anconeus serve to extend the elbow. The proximal radioulnar joint engages in pronation and supination, with the supinated position being anatomic position. The proximal radioulnar joint requires concomitant movement at the distal radioulnar articulation to engage fully in its actions. Proximally, the supinator and biceps brachii function to supinate the forearm at the elbow and the pronator teres and pronator quadratus pronate the forearm. Anteriorly, the humeral head of the pronator teres is attached to the medial epicondyle of the humerus along with the flexor carpi radialis, the palmaris longus (if present), the humeroulnar head of the flexor digitorum superficialis, and the humeral head of the flexor carpi ulnaris at the common flexor origin. The ulnar head of the pronator teres attaches at the coronoid process, and the ulnar head of the flexor carpi ulnaris attaches at the olecranon. The humeroulnar head of the flexor digitorum superficialis does extend over to the coronoid process. The humeroulnar and humeroradial articulations of the elbow joint are served by the musculocutaneous, radial, and ulnar nerves. Anteriorly, the lateral aspect of the elbow joint is covered by the C6 dermatome; the more medial area is covered by the C5 and T1 dermatomes; and, finally, the medial aspect is covered by the C8 dermatome. Posteriorly, the C6 dermatome laterally and the C8 dermatome medially are split down the middle by the C7 dermatome. The inferior lateral cutaneous nerve of the arm and the posterior cutaneous nerve of the forearm are the sensory nerves of the lateral elbow. The medial cutaneous nerve of the forearm, via its ulnar (posterior) and anterior branches, supplies sensation to the medial aspect of the elbow. Across the anterior aspect of the elbow, in the cubital fossa, the sensory branch of the musculocutaneous nerve (the lateral cutaneous nerve of the forearm) supplies sensation. Crossing the elbow joint anteriorly is the median nerve. Just proximal to the joint, it gives off a branch to the pronator teres, where the muscle originates at the medial epicondyle; just distal to the joint, it gives off branches to the palmaris longus (if present), to the flexor carpi radialis, and again to the pronator teres before continuing down the forearm. Posteriorly, the ulnar nerve travels medially down the arm to pass posterior to the elbow joint in a groove at the posterior aspect of the medial epicondyle, known as the cubital tunnel; it then gives off branches to the flexor carpi ulnaris and the medial half of the flexor digitorum profundus just distal to the joint before continuing down the forearm. The radial nerve is an interesting case. Passing from the posterior as it leaves the radial groove laterally in the arm, it gives off branches to the brachioradialis and the extensor carpi radialis longus before splitting into the superficial and deep branches proximal to the elbow joint and then traveling anterior to the elbow joint. 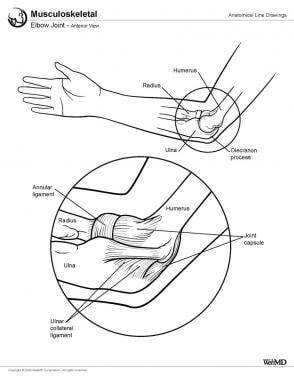 The blood supply to all the articulations of the elbow joint comes via local branches from the periarticular arterial anastomoses of the elbow region. The brachial artery gives off the superior and inferior ulnar collateral arteries (which generally anastomose with each other as well), and the deep artery of the arm continues and splits into the radial collateral and middle collateral arteries. After crossing the elbow joint in the cubital fossa, the brachial artery splits into the ulnar and radial arteries. The ulnar artery gives rise to both the anterior ulnar recurrent artery, which joins the inferior ulnar collateral anterior to the medial epicondyle of the humerus, and the posterior ulnar recurrent artery, which joins the superior ulnar collateral artery posterior to the medial humeral epicondyle. Many disorders may occur at the elbow. Any of the bones can be fractured, any of the muscles can be pulled, any of the tendons can be injured, and any of the ligaments can be sprained. Additionally, injuries more proximally in the arm may influence actions at the elbow and leave deficits in function or sensation at the elbow even if the joint itself is intact. Some common pathologic conditions of the elbow are discussed below. Dislocation of the radial head ("pulled elbow") occurs when a distraction force is applied along the long axis of the forearm from a point distal to the elbow. As a consequence, the head of the radius can be pulled out of the anular ligament that holds it in place. Typically these injuries occur in young children, often girls. The classic description of the injury involves a parent or other adult figure lifting a child up vertically by a single hand. The child then holds the arm flexed at the elbow and pronated at the forearm. Reduction of the dislocation can be performed by supinating the forearm with the elbow flexed. Lateral epicondylitis ("tennis elbow") involves inflammation of the tendons that insert into the common extensor origin at the lateral epicondyle of the humerus. Repetitive extension movements at the wrist cause an overuse syndrome of the wrist extensors and pain at the aforementioned insertion just superior to the elbow. Generally, damage to the extensor carpi radialis brevis is the chief culprit, with the overuse also causing weakness. Treatment is aimed at decreasing inflammation and strengthening the wrist extensors. Cubital tunnel syndrome causes paresthesias in the distribution of the ulnar nerve, attributable to compression of the nerve as it passes in a groove behind the medial epicondyle of the humerus (the so-called cubital tunnel). The location of the ulnar nerve at the elbow is also referred to as the funny bone. Because the nerve has very little padding as it passes through this area, it is easily compressed, and the compression causes a neurapraxia of the ulnar nerve and, ultimately, paresthesias. Treatment is aimed at relieving pressure on the nerve and decreasing inflammation, if present. Pronator syndrome is a compression neuropathy of the median nerve as it passes between the 2 heads of the pronator teres muscle. The syndrome can cause paresthesias in the distribution of the median nerve distal to the compression and may lead to weakness in the flexor pollicis longus, the flexor digitorum profundus laterally, and the pronator quadratus. Generally, the pronator teres itself is unaffected, because it is already innervated before the passage of the nerve between the 2 heads of the muscle. The neurapraxia of the median nerve can be relieved with steroid injections or other methods aimed at decreasing inflammation; in some cases, surgical release is indicated. Olecranon bursitis ("student's elbow") is an inflammation of the olecranon bursa at the proximal aspect of the posterior ulna. It can be caused by trauma, infection, prolonged pressure, or other conditions that may cause inflammation. The bursa becomes swollen and is often painful. Draining the bursa and analyzing the fluid obtained can help yield a diagnosis of the underlying cause toward which treatment should ultimately be directed. Infectious causes should always be ruled out. Beals RK. The normal carrying angle of the elbow. A radiographic study of 422 patients. Clin Orthop Relat Res. 1976 Sep. 119:194-6. [Medline]. Moore KL, Dalley AF. Clinically Oriented Anatomy. 5th ed. Lippincott Williams & Wilkins; 2006. Beckett KS, McConnell P, Lagopoulos M, Newman RJ. Variations in the normal anatomy of the collateral ligaments of the human elbow joint. J Anat. 2000 Oct. 197 Pt 3:507-11. [Medline]. Faubel C. Posterior Interosseus Nerve. The Pain Source. Available at http://www.thepainsource.com. Steel FLD, Tomlinson JDW. The ‘carrying angle’ in man. J Anat. 1958. 99(2):315-317. Yamaguchi K, Sweet FA, Bidra R, Morrey B, Gelberman R. The extraosseous and intraosseous arterial anatomy of the adult elbow. J Bone Joint Surg. 1997. 79:1653-62. Chumbley EM, O'Connor FG, Nirschl RP. Evaluation of overuse elbow injuries. Am Fam Physician. 2000 Feb 1. 61(3):691-700. [Medline].